Photo Credit: David Kamm, NSRDEC. Researchers, at the Natick Soldier Research, Development and Engineering Center, the University of Massachusetts Lowell, and Triton Systems, Inc., are collaborating on the technical development of self-healing technologies that will be used to mend chemical-biological protective clothing. Army researcher Quoc Truong wants to fill in the gaps in Soldier protective clothing - literally. Truong is a physical scientist at the U.S. Army Natick Soldier Research, Development and Engineering Center, or NSRDEC. He is collaborating with other researchers at NSRDEC, the University of Massachusetts Lowell, and Triton Systems, Inc., on the technical development of self-healing coatings that contain micro-capsules of healing fluid, which will be used to mend chemical-biological, or CB, protective clothing. The self-healing technologies will enable cuts, tears and punctures in fabrics to quickly repair themselves. This means that the protective qualities of the garments will be far less apt to become compromised by tears and punctures. The technology will be incorporated into both the Joint Service Lightweight Integrated Suit Technology, or JSLIST, garment, and the Joint Protective Aircrew Ensemble, or JPACE, garment. Photo Credit: Jesse Hamilton, University of Massachusetts Lowell. 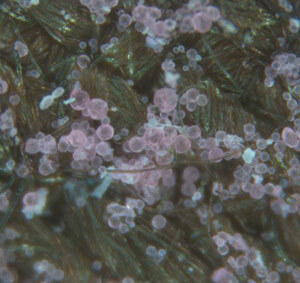 Microcapsules - shown here sprayed on Army fabric - are being developed to enable chemical-biological protective clothing to mend itself when punctured or torn. 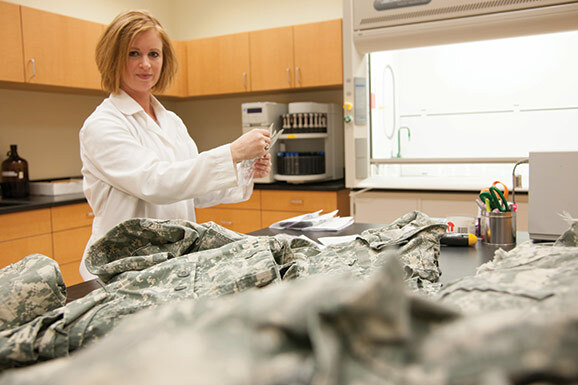 The Natick Soldier Research, Development and Engineering Center, the University of Massachusetts Lowell and Triton Systems, Inc., are collaborating on the technical development of self-healing fabric technologies. The technology combines innovative approaches to gap-closure with healing micro-capsules that are activated when torn to repair cuts and punctures. The self-healing layer contains reactive agents to deactivate dangerous threats, including deadly chemicals, and also acts to reform the physical barrier to bacteria and viruses. When integrated into a CB protective garment, the self-healing technologies help ensure that the CB protection is uninterrupted. The JPACE’s protective mechanism is based on a selectively permeable membrane; therefore, the microcapsules are embedded into the selectively permeable membrane and/or in a supporting reactive selectively permeable membrane layer, which will act as a self-healing supporting barrier material. When the membrane breaks, these microcapsules open and mend the tear in about 60 seconds, filling the gap with the aid of the gap-closure technology. 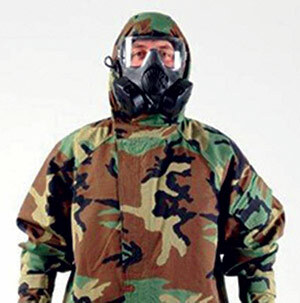 The JSLIST chemical protective overgarment is based on a non-woven material that carries activated carbon spheres. Thus, it is air permeable and doesn’t lend easily to the use of microcapsules. So, the JSLIST suit configuration has to be sprayed with microcapsules and a foaming agent. Truong is dedicated to continuously improving safety for the soldier. The technology also has commercial applications.